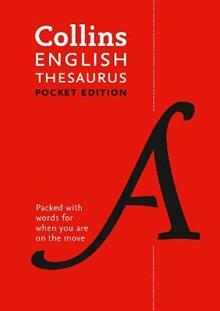 Collins Pocket Thesaurus has a wide range of up-to-date entries, a generous choice of synonyms, and thousands of antonyms, giving unrivalled everyday language coverage for a thesaurus of its size. The hard-wearing vinyl cover makes it an ideal reference book for carrying to schoo... read full description below. Collins Pocket Thesaurus has a wide range of up-to-date entries, a generous choice of synonyms, and thousands of antonyms, giving unrivalled everyday language coverage for a thesaurus of its size. The hard-wearing vinyl cover makes it an ideal reference book for carrying to school or work. This new edition of Collins Pocket Thesaurus provides up-to-date language coverage along with practical guidance on effective English for everyday use. All main entry words are highlighted in colour and the most helpful synonyms in each entry are given first and highlighted to ensure you find what you're looking for in the shortest time. With key antonyms included for many entries and the unique supplement, Collins Pocket Thesaurus is the ideal one-stop reference source for every home and office.